This post begins a holiday series of posts that features Mexican influenced dishes for a slightly off-beat, yet still damn traditional, Thanksgiving fiesta! This year for Thanksgiving T & I are going to be traveling up to San Francisco to share our holiday with some great friends, both new and old. The old being my hommie, Yvonne and her delightful sig other Drew; and the new being the utterly fabulous and f*cking hysterical food blogger, Leena & her hubby Adam. Now you know when you put two kickass food bloggers in charge of making a holiday meal something great is bound to happen. In this case, Leena threw out two suggestions. 1) a Mexican Themed holiday meal and 2)elevated spinoffs of holiday food. I promptly rejected option one since, well… I cook Mexican food all the time. Like every week. Unforunately for Leena, she planted a seed in my brain about doing a Mexican holiday meal. That seed, mixed with the large container of homemade mole chillin in my freezer, sprung to life and thus we had a Mexican themed pre-holiday meal (where I didn’t have to make any gravy & used up my mole) with our awesome friends Nicole & Justin. 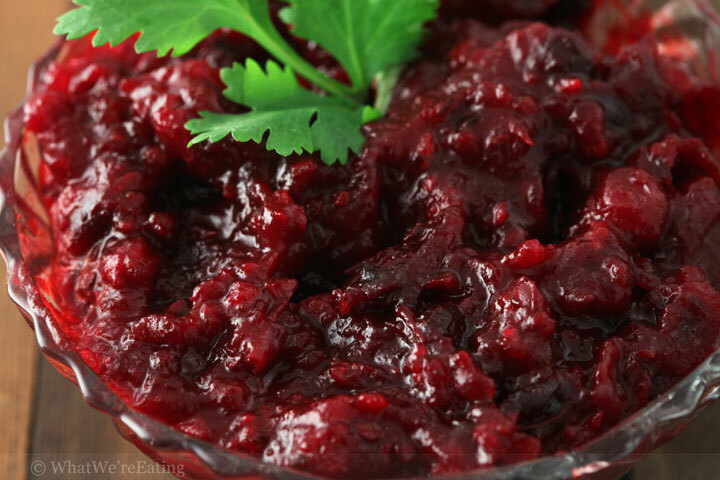 In my traditional lazy fashion let’s start things off with the easist dish at the party – the cranberry sauce! This element of holiday meals is soooo simple to prepare yet somehow people still reach for the canned version. We fused tradition cranberry sauce with some mexican flavors by adding in some pureed chipotle in adobo and cumin. I believe Tyler said something like “wow. that is an agressive cranberry sauce!” He then clarified that he meant spicy! I love spicy so of course I used 2 tbsp of chipotle but if you don’t like it that spicy just use one. Add all ingredients to a sauce pan and place over medium-high heat. Bring the liquid to a boil then reduce heat to a simmer. Simmer until the cranberries have burst and the mixture is thick, about 25-30 minutes. Stir occasionally. Sauce can be made upto 2 days in advance. Store chilled. Enjoy! Thanks so much for the compliments on the sauce. There actually is a button inside of the recipe box that says “Print Recipe”. If you click on that button it takes you to a page that contains only the recipe (w/o any of the other BS). Several years ago we added that feature because, like you, I thought it was an injustice to have to print the entire page to just get the recipe. Happy Thanksgiving! I tried this recipe for the first time this Thanksgiving, and loved it! Next time I’ll probably use slightly less cumin for those with weaker palates, but I’m excited to try it again as an accompaniment to pork meatballs and brie; I think they’ll go together quite well!